Green infrastructure (GI) is a community or watershed-based coordinated effort to enhance community livability through the integrated use of lot-level stormwater control measures and land conservation approaches for managing stormwater water and natural ecosystems. 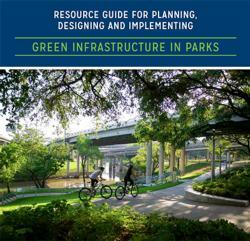 Why Green Infrastructure in Community Parks? A park is a natural, semi-natural, or planted public space dedicated for human leisure and recreation, and for the protection of wildlife and natural habitats. Because parks play a vital role in community livability, incorporating GI practices into park and recreation environments enhances quality of life. Enhancing recreation value with enhanced amenities such as ponds, creeks, natural drainage and infiltration practices in parks. Creating attractive park features, including bioretention areas, picnic and play areas with trees, shrubs, and ornamental grasses or native plants that can attract beneficial wildlife (e.g., butterflies or other pollinators). Enhancing social and environmental equity with opportunities for physical activity, interactions with nature, and gathering places in underserved or underprivileged communities. Reducing maintenance with replacement of high maintenance vegetation (such as turf) to lower maintenance native vegetation. Adoption of natural infiltration practices can help reduce runoff and erosion problems leading to reduction in maintenance costs. 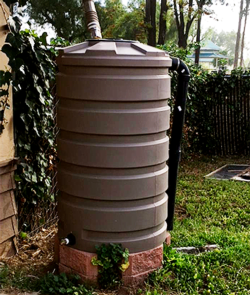 Providing economic benefits such as increased investments in business in the proximity of the park, use of harvested rainwater to reduce costs for irrigation and other graywater uses, and earnings of stormwater utility credits in stormwater fee areas. Improving drainage, leading to mitigation of nuisance flooding in nearby parking areas and roadways. Contributing to public awareness of the importance and type of stormwater measures that reduce stormwater pollution, create green jobs, and educate the new green work force. 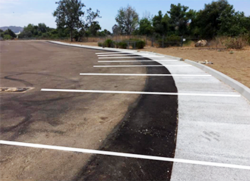 Improving water quality with pervious surfaces to absorb runoff from adjacent developed areas that drain directly to piped conveyance systems, leading to reduction in stormwater volume and pollutant loading into these piped systems. Providing beauty to the parks and the overall environment. When initiating a new park project, the County of San Diego looks to incorporate and showcase sustainability and green infrastructure. With our semi-arid climate and low annual rainfall, we don’t see as much “green” as other parts of the country, but we still work to ensure we’re using our rainfall wisely and not sending it down a storm drain. 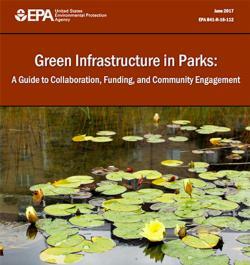 County Parks is a leader in green technology. 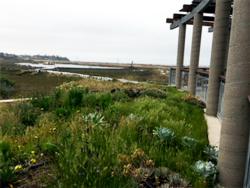 Our efforts range from rain barrels at park offices to the green roof at the San Elijo Lagoon Nature Center; conserving 50,000 acres of natural habitat through our Multiple Species Conservation Plan and implementing tree planting and replacement through our comprehensive tree program. 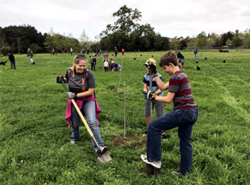 We collaborate with the community and provide education and interpretation opportunities throughout the County to demonstrate the importance of green infrastructure. We have had greatest success and community feedback when our projects enhance the environment and existing natural habitats. Green infrastructure is a relatively new concept in San Diego, but well-regarded as a viable means to manage stormwater, improve equity, and maximize community benefits. The county implemented many GI practices including bioretention, bioswale, constructed wetland, impervious surface disconnection, green roof, permeable pavement, rainwater harvesting, stream restoration, tree canopy and conservation of green space, and vegetated buffer. These practices can be incorporated into existing parks or new park developments to ensure that green space is utilized to its full potential in urban environments.